After choosing to move into ‘Task’ or ‘Calendar’ you will be able to categorize. 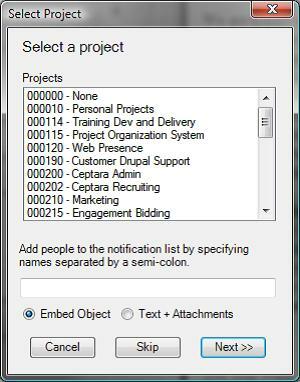 Once a Project is selected or the ‘Skip’ button is pressed, a new task or new appointment is created that encapsulates the initiating email as either a) text with attachments, or b) embedded object depending on which is selected in the Options. (Reminder: You can modify the Options in the Project Explorer via Tools – Options). The originating email will also be ‘Categorized’ to the selected project and will show up in the Project Explorer if it’s not deleted and/or archived out of the default folder set. 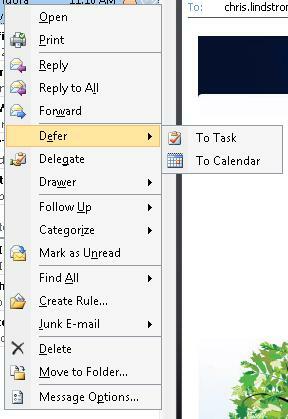 The task can now be scheduled via the ‘Due Date:’ field or show up on the Master Task List. A Focus can be selected, and the action can be clarified in the ‘Subject:’ field so it’s clear what work is to be performed. The appointment can be modified to meet the schedule expectations.